A helicopter carrying two people came crashing down on a busy Florida highway Thursday, killing the driver of a truck with a rotor blade that had flown off during the crash. 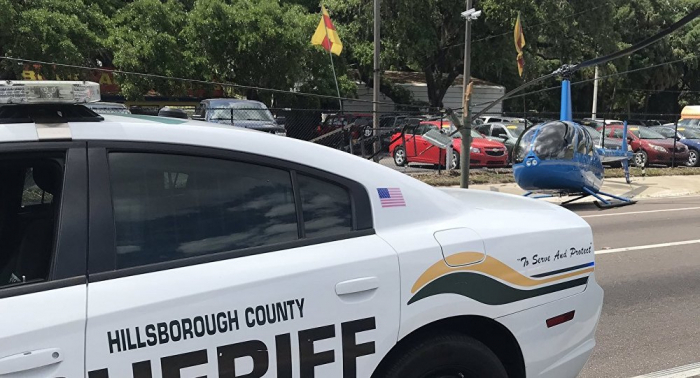 The chopper was hovering over 50th Street in Palm River, near Tampa, when it suffered an engine failure and fell out of the sky, WFTS-TV reported, citing the Hillsborough County Sheriff’s Office. A man driving a Chevrolet Silverado down the road with his son was reportedly hit by a rotor blade, which killed him on the spot. The man’s son was transported to Tampa General Hospital. His condition was not known. Police officials told WFTS that the two people in the helicopter were not injured. They were described as highly trained pilots and the helicopter was recently in for service, according to the New York Post. Officials said the pilots were on their way to Sarasota. All lanes along 50th Street and Palm River Road were expected to remain closed for at least 6-12 hours as the investigation of the crash continues.